Sometimes sudden news brings completely mixed feelings. 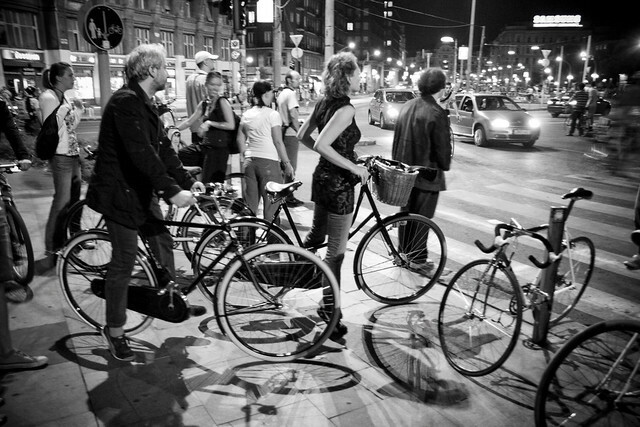 This year's Cycle Chic Blogger's Conference will be held in Budapest in September. Heaps of events like a Cycle Chic breakfast for the Citizen Cyclists of the city, a fashion show, the conference and... the legendary critical mass ride held twice a year in the city. Nobody does a mass ride like the Hungarians. They can average 20,000 people on bicycles and have even hit the lofty heights of 50,000 and 80,000. It was going to be one of the highlights of the weekend. The organisers, however, have just decided to cancel the ride. Many people are disappointed but in their statement they say that Budapest has now reached a point of being a bicycle city with many daily cyclists. They cancelled it because they want the focus to now be on the amazing work done by the Hungarian Cyclists’ Club - Magyar Kerékpárosklub. The NGO needs more support in order to continue it's work and the critical mass organisers wished to place focus on the NGO by cancelling. What an accolade for the Hungarian Cyclists' Club, who are legendary for their positive promotion of cycling. Budapest is one of the poster children cities for what they have achieved in just five or six years. They are legends. 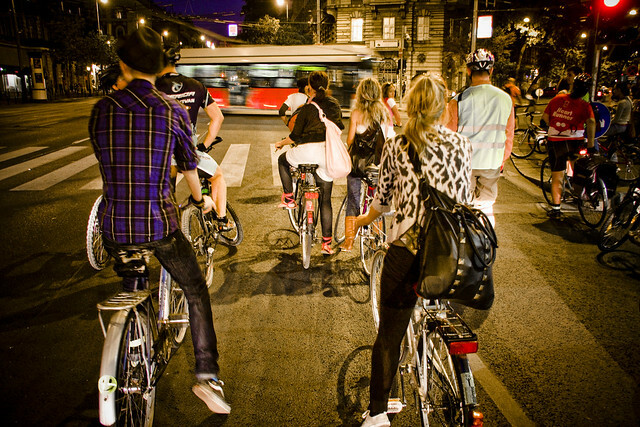 The critical mass in Budapest, like in many European cities, is far removed from the North American versions. It is a celebration of urban cycling and a powerful tool towards pushing for a more liveable city with more bicycles, rather than a sub-culture peacocking through the streets, irritating the other citizens and doing little to win hearts and minds. Indeed, the critical mass ride in Prague changed it's name in order to disassociate itself with the negative North American brand. In Budapest, politicians join in, people from all walks of life ride. It became an accepted and even anticipated event in the life of the city. "Even more powerful new engines have emerged: The Cycle Chic Movement, which is successful in increasing ridership and breaking down stereotypes with greater visual impact in the city." One of the most humbling things to read in almost six years of Cycle Chic. Stunningly so. The most successful "critical mass" bike rides in the world handing over the reins to Cycle Chic. It must be said that Hungarian Cycle Chic is a flagship among the members of our Cycle Chic Republic. Operating out of the Hungarian Cyclists' Club, they have been instrumental in mainstreaming urban cycling in Budapest. I have been at meetings with them discussing our sociological, anthropological and marketing approaches. Despite the massive responsibility handed over by critical mass, if there is anyone in Hungary who can do the job, it's the Cycle Chic team in Budapest, as well as the Hungarian Cyclists' Club. If your city had just half of the vision that the advocates have in Budapest, you'd be ten times farther along the road to mainstreaming urban cycling. That's how brilliant they are. Here's hoping that the mass ride will return. And that we can live up to their expectations whether they do or not. Budapest Critical Mass Sept 2009 from Copenhagenize on Vimeo. 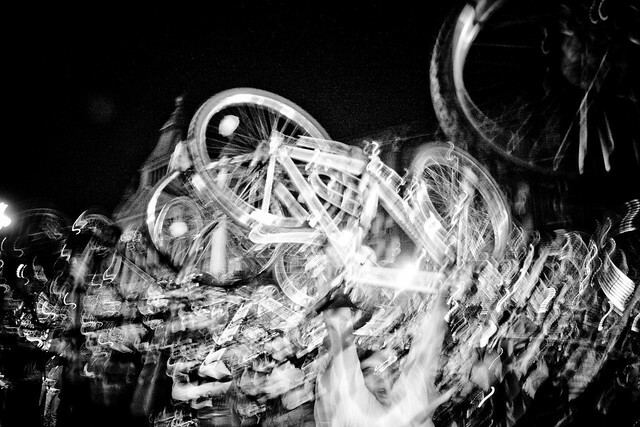 Here's a film I shot during the critical mass bike ride in 2009. Here's a film made by Hungarian Cycle Chic. Hope some of you can make it to our 20th anniversary in SF this late September!